eSource Optics Broadband VUV to UV Optical Beamsplitters (BBVUVBS) are Metallic VUV to UV broadband beamsplitter optical coatings that are designed to provide 40% to 50% average Reflectance and Transmission over the 170nm to 300nm VUV-UV wavelength range @ 45 degrees Angle of Incidence (AOI) Unpolarized. 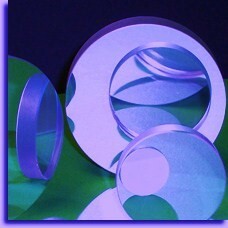 eSource Optics Broadband VUV to UV Optical Beamsplitters (BBVUVBS) are available in standard 25.4mm and 50.8mm Diameters. Other sizes are available upon request. eSource Optics Broadband VUV to UV Optical Beamsplitters (BBUVBS) are metal-dielectric-metal (MDM) design thin-film coatings supplied as Unmounted and Open-Faced VUV-UV Beamsplitters. Open-Faced Broadband VUV to UV Optical Beamsplitters (BBUVBS) are manufactured using high purity UV grade Fused Silica substrate for VUV to UV wavelengths 170nm to 300nm. All VUV to UV Optical Beamsplitters (BBVUVBS) substrates are highly polished to a <=40-20 scratch & dig surface quality with less than 5 arc minutes parallelism. Availability: eSource Optics VUV to UV Beamsplitters are supplied on a per order basis; lead-time is typically within ~3-4 weeks. 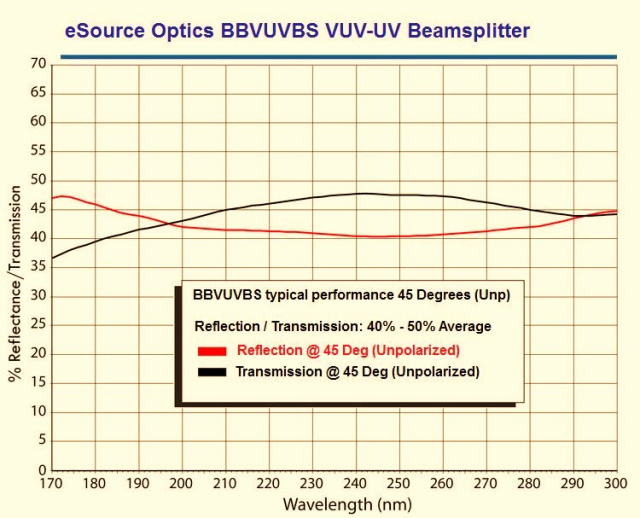 All eSource Optics Broadband VUV to UV Optical Beamsplitters (BBVUVBS) are supplied with individual Vacuum UV % Reflection/Transmission Calibration Curves detailing 45 degree (unpolarized) VUV through UV spectral performance characteristics. Broadband VUV to UV Optical Beamsplitters (BBVUVBS) are mainly used in VUV to UV light source and low power applications requiring nearly equal separation of Reflected and Transmitted broadband VUV through UV wavelengths.